Tanaza features a captive portal, allowing WiFi network administrators to create and customise splash page for public hotspots. Indeed, Tanaza splash page editor gives the opportunity to owners of a venue to promote and deliver additional services to WiFi users. There are many ways to leverage the splash page of a public hotspot, such as for example encourage WiFi users to download an application, leave a TripAdvisor review, follow a Facebook page or redirect them to another website. WiFi network administrators can encourage WiFi users to download an iOS or Android application before accessing a public hotspot, which is really useful when managing WiFi hotspots in locations like museums, restaurant chains, shopping malls, sports venues, municipalities, private medical centers, fashion retail shops, furniture shops, shopping outlets, supermarkets and so on. By simply creating a redirection button to the download platform of an app (iTunes Store for iOS or Google Play Store Android) on the Tanaza splash page, a hotspot administrator can redirect WiFi users and offer them additional services. For example, a museum could promote its audio-guide application on its splash page, a restaurant could promote its “take-away” service application and a brand could promote its e-commerce app to people that are in its fashion retail shop. Tanaza allows restaurant owners to increase their visibility on review platforms such as Tripadvisor, Zomato, Yelp, etc. Indeed, WiFi network administrators can customise the splash page, adding a redirection button or image to the restaurant TripAdvisor page. The idea is to encourage clients to leave a review about their experience in exchange for free WiFi. Another marketing idea could be to ask for a review on Tripadvisor in exchange for a free café for example. When accessing a WiFi network, users have often the possibility to connect using their social media account such as Facebook. In this case, a WiFi network administrator could ask them to like a page or to geolocate themselves in a location on Facebook. This allows the owner of a venue to increase his social visibility and to engage with more customers. To do this, simply enable the option “social actions” on the splash page settings. We recommend you to ask whether for a Like or a Check-in to WiFi users. One possible scenario is that the user is asked for a “Like”, then connects to the internet. When connecting the second time to the network, depending on the settings, he’s asked again for the “Like” (if not done) or he’s asked for a check-in in a specific place. Find more information about how you should communicate about social actions in this article. Tanaza allows WiFi network administrators to configure an external splash page and deliver additional services to WiFi users y adding an external radius server on top of the Tanaza infrastructure. This function is really useful in scenarios like in a supermarket, where the WiFi administrator sets up the social login or a login through a fidelity card. Also, the external splash page can be used when WiFi administrators want to enable their own splash page or SMS gateway different from the Tanaza’s one. To conclude, customising the splash page of a public hotspot is a fundamental step in the communication and marketing plan of any businesses willing to promote and deliver additional services to their customers. It allows businesses to offset costs of the WiFi infrastructure but also to enhance the final experience of their users. Tanaza hotspot system is now compatible with Cisco Meraki indoor and outdoor devices. Tanaza’s compatibility with Cisco Meraki enables WiFi professionals to utilize Tanaza’s hotspot features on Meraki devices, without replacing the vendor’s firmware. Tanaza’s integration with Cisco Meraki enables Meraki Cloud Dashboard users to continue managing their access points from the Meraki interface while simultaneously using the Tanaza captive portal. With Tanaza, the WiFi network administrator can also customize the splash page of multi-vendor networks, composed of access points of different brands (including Meraki) from a single centralized dashboard. Thanks to this new integration, Cisco Meraki users can set up free and paid hotspots with Tanaza’s captive portal. This means that WiFi network administrators will be able to create and customise their captive portals, collect data about WiFi users, and leverage their WiFi networks for marketing purposes. Tanaza’s hotspot features such as the analytics dashboard, “remember me” and the splash page editor with its advertising tool and its multiple authentication methods, such as custom forms, social login and the couponing system, etc, will be available on Meraki-based WiFi hotspots. This compatibility is still in BETA stage and is available on request for any Meraki devices. If you would like to test out this new integration, please contact sales@tanaza.com. Tanaza core is to provide an all in one software that empowers the feature set of 3rd party access points in the SMB range, adding an extremely easy to use hotspot software. Since our customers, mainly channel partners, MSPs, system integrators, were extremely satisfied to use Tanaza for cost-efficient deployments and highly valued our hotspot features, they expressed interest in using it also with their more enterprise deployments. For this reason, we listened to the feedback from our community for ideas and decided to make Tanaza’s hotspot system compatible with Cisco Meraki devices. WiFi Social login facilitates the customers’ experience when trying to connect to a WiFi network and provides user data to network administrators who wish to promote their product or service based on data-driven decisions. When deploying a public WiFi network, authentication methods like WiFi social login can help any type of business generate new leads and increase its brand awareness. The social login authentication method gathers important data like user email address, phone number, gender, age, birth date, location, and name, etc. Thanks to Tanaza’s WiFi Authentication Splash Page, which already includes social login capabilities, network administrators can leverage the personal data shared on social networks to create targeted marketing campaigns based on a user’s profile info. However, as not all users make their information public on their social networks, in some cases it is possible that the user data provided by social networks is not enough to develop a targeted marketing campaign. With this in mind, Tanaza has plans to develop a new feature that helps network administrators collect custom data in addition to the data already collected once they have already authenticated using popular methods like social login. The idea behind this feature is to provide a system that allows network administrators to request additional information about their users by inserting a custom form field after social authentication and before optional social actions that users must fill in before connecting to the WiFi. Furthermore, since the data collected is not always 100% reliable, this feature could also function as a form of verification regarding the accuracy of any previous data collected. One of the most common use case scenarios where a feature like this could be applied is one where network administrators deploy public hotspots in locations like shopping centers in order to collect relevant data about their visitors. So, say a user at a mall authenticates through social login, the network administrator could also use custom form fields to request additional info, such as their fidelity card number and their mobile number. The fidelity card number would enable the network administrator to understand who the user is and targeted it more closely with discounts and offers tailored specifically to the user, whereas the mobile number would serve as a verification system in order to identify the number of users (one phone number = one wifi user) or to avoid the creation of fake accounts. A OTP (One Time Password) would be sent to the mobile number, which the user would be asked to copy-paste the code into the splash page in order to complete the login. This feature could allow network admins to practice data profiling with the data collected using popular login methods like social login or coupons, and at the same time collect custom verified data to support a variety of loyalty marketing campaigns. The incremental field verification feature could be made available after any kind of login available on the captive portal, including coupons. If you wish to see this feature developed by Tanaza’s R&D team, you can upvote it on our success portal. WiFi is now a fundamental service developed in public places to enhance customers experience and engage with them. It is true that people are usually expecting to connect to a WiFi network for free. Nevertheless, in some particular cases, customers are willing to pay to access to the internet. Indeed, according to the Devicescape, nearly 25% of 3,000 people surveyed said that they could pay up to $3 an hour for WiFi. Thus the main difficulty for an internet service provider when selling WiFi is to strike the balance between the price of WiFi and the service provided. We recommend WiFi professionals to configure paid hotspots only if there are not too many free hotspots in the same area. The WiFi network administrator has to bring an added-value to WiFi users to encourage them to pay. This could be for example the fact that there is no free alternative, or an extra capability for the user when browsing the internet. The typical environments to develop WiFi paid hotspot are public places like airports, train stations, hotels, conferences and events or holiday resorts. Indeed, by using the Tanaza couponing system, WiFi network administrators can manage the expiration date, the session duration, the number of allowed devices, the bandwidth per SSID and the maximum amount of data in download and upload, allowing them to suggest different offers to WiFi users. 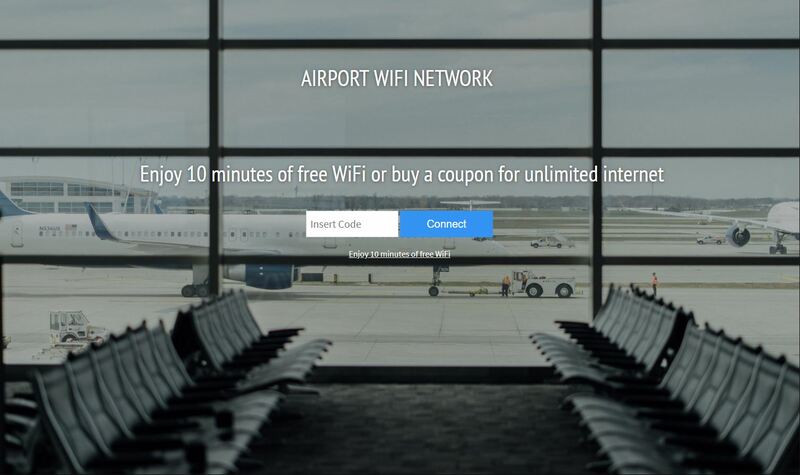 One possible configuration in an airport could be to provide 10 minutes of free WiFi with limited upload data and then, sell coupons for unlimited WiFi session to WiFi users who need more. The custom splash page should show to WiFi users which are the different possibilities by displaying a message such as “use WiFi for free for 10 minutes. Buy a coupon for unlimited internet session”. Coupons can be sold directly to a front desk or through external splash pages featuring a credit card system or a PayPal platform. The Tanaza couponing system allows WiFi network administrators to generate tons of coupon passwords quickly and to control the usage of these. All details are stored on the dashboard such as the status (used/unused), the date of creation, the expiration date, the download quota, the upload quota and the number of devices connected. Coupons can also be invalidated or reprinted. We recommend WiFi network administrators to configure at least two different public SSIDs: the first one with limited bandwidth, limited time session and a limited number of devices per user. The second one, with the coupon login mode, with unlimited bandwidth, unlimited time session and an unlimited number of devices per user. Find out more information below in our Tanaza Couponing system presentation! Tanaza is a software for WiFi management that allows owners or public places to turn their public hotspot into a lead generation and marketing tool. Indeed, Tanaza features a built-in captive portal that enables network managers to personalise the way WiFi users log to the network and so the type of users data collected. Find out in this article how to maximise a WiFi hotspot in a public place like a bar. Tanaza features many login modes which allow you to gather different types of information about your customers like name, surname, age, gender, location, birthdate, type of device (smartphone, computer, tablet). WiFi network administrators can choose between email authentication, telephone number, button login, social login (Facebook, Instagram, Twitter, Linkedin etc. ), custom form. In a previous article, we explain to you why the Social login is one of the most easiest login modes for public spaces like bars and restaurants. Keep in mind that in public places like bars and restaurants, most WiFi users access the network with their smartphone, so think responsive and set up a mobile-friendly login mode. 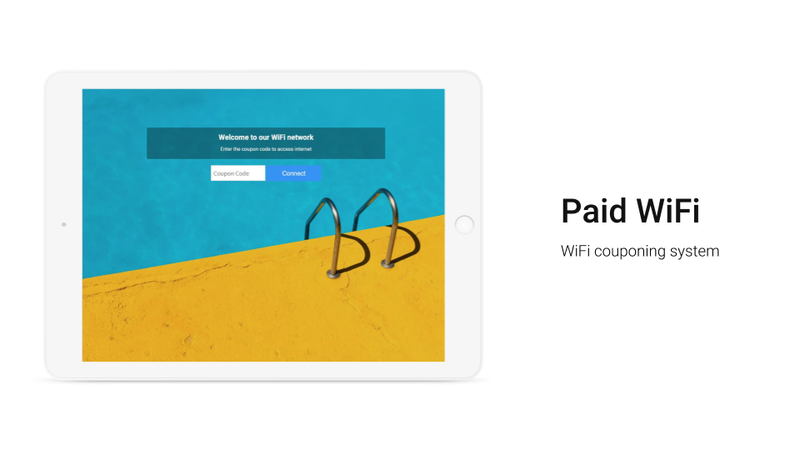 Tanaza captive portal collects data about WiFi users in a location, allowing the WiFi administrators to generate leads for their end-user customers. With Tanaza, venues like bars and restaurants gather real and up-to-date insights about their clientele, allowing them to understand their customers better and position their brand and services more effectively. Moreover, lead generation through WiFi is extremely cost-effective as it has only fixed costs, not variable costs based on the number of collected leads. WiFi network administrators can generate tons of leads by simply enable the Tanaza captive portal, and export all data collected to a third marketing application like MailChimp. The information and data captured about WiFi users are automatically stored within the Tanaza’s analytics dashboard which is an intuitive web-based tool to access social stats and clients’ contact details. The dashboard helps WiFi network administrators analysing data and discovering how to better engage with customers. Once data is collected and stored on the analytic dashboard, WiFi network administrators can engage with their end-user customers, generating more online and offline conversions. Customers are engaged while connected to WiFi making them more likely to appreciate discounts/offers, familiarise them with a brand, incentivise to make a purchase and to interact with the brand on social media. 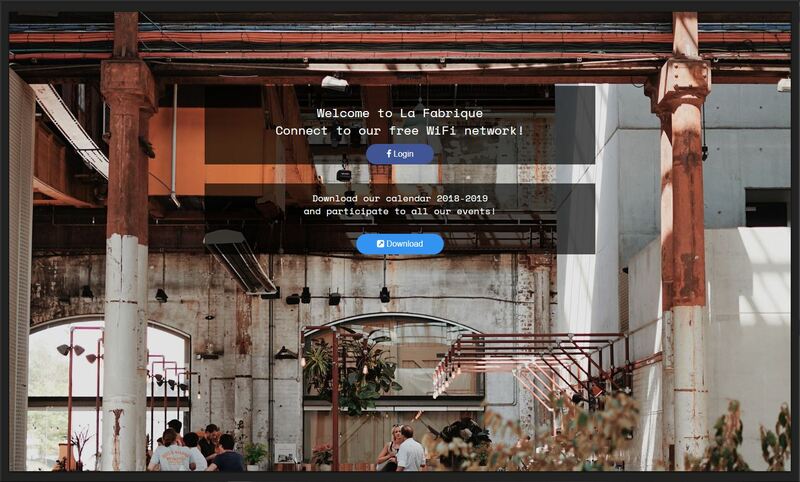 For example in a bar, WiFi network administrators can encourage customers to come back to the venue by offering them a discount on the splash page and give them information about upcoming events. Build a community and promote your venue thanks to your WiFi hotspot. When setting up a WiFi network in public places like bars or restaurants, WiFi network administrators should consider the Facebook Social Login to enhance their visibility on social media. Indeed, Tanaza allows network administrators to ask for likes and check-in to WiFi users. For example, after clicking on the Facebook social login, the user is asked for the basic permission and to “Like” a specific Fan/Business Page. The check-in action consists of asking WiFi users to geolocate themselves in your location. Social WiFi actions allow WiFi network administrators to increase the visibility of their end-user customers on social media and so to increase the number of returning clients in a location by sharing news, events, special offers etc. directly to the right target. Learn how to create a splash page for your venue by watching this video: add your logo, brand, background, and text. Create redirection links and choose the right login mode.